Confidence for Molly has come from taking excellent care of her horses, paying special attention to her equipment, and practicing for the perfect competition run. Time after time, turn after turn, Molly has shown that her techniques have enabled her to stay at the top. Molly's consistent turning horses have taken her to the pay window for over a half of a million dollars, and now you can learn her successful ways! This Volume 1 edition focusing on "Building Confidence in Your Turns" shows Molly's step by step approach to the barrel turn. Molly shares her favorite tips on barrel racing and her knowledge of what it takes to win in this entertaining video. Molly Powell has a love for barrel racing and horses that has enabled her to win at the professional level for twenty years. 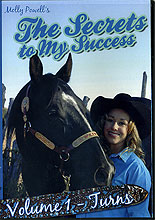 Whether on her own horse, or a borrowed horse, Molly has gathered prestigious championships at the 2002 Olympic Rodeo, the College National Finals Rodeo, the Wrangler National Finals Rodeo, Canadian Finals Rodeo, and the $50,000 bonus at the Calgary Stampede Showdown.